Yesterday, I annotated our Olympia oyster genome using WQ-MAKER in just 7hrs!. See that link for run setup and configuration. They are essentially the same, except for the change I’ll discuss below. In that previous run, I neglected to provide a transposable elements FastA file for use with RepeatMasker. This TEs file is part of RepeatMasker. This run took about an hour longer than the previous run, but for some reason it ran with only 21 workers, instead of 22. This is probably the reason for the increased run time. I’d like to post a snippet of the GFF file here, but the line lengths are WAY too long and will be virtually impossible to read in this notebook. The GFF consists of listing a “parent” contig and its corresponding info (start/stop/length). Then, there are “children” of this contig that show various regions that are matched within the various databases that were queried, i.e. repeatmasker annotations for identifying repeat regions, protein2genome for full/partial protein matches, etc. Thus, a single scaffold (contig) can have dozens or hundreds of corresponding annotations! Probably the easiest and most logical to start working with will be those scaffolds that are annotated with a “protein_match”, as these have a corresponding GenBank ID. Parsing these out and then doing a join with NCBI protein IDs will give us a basic annotaiton of “functional” portions of the genome. Additionally, we should probably do some sort of comparison of this run with the previous run where I did not provide the transposable elements FastA file. 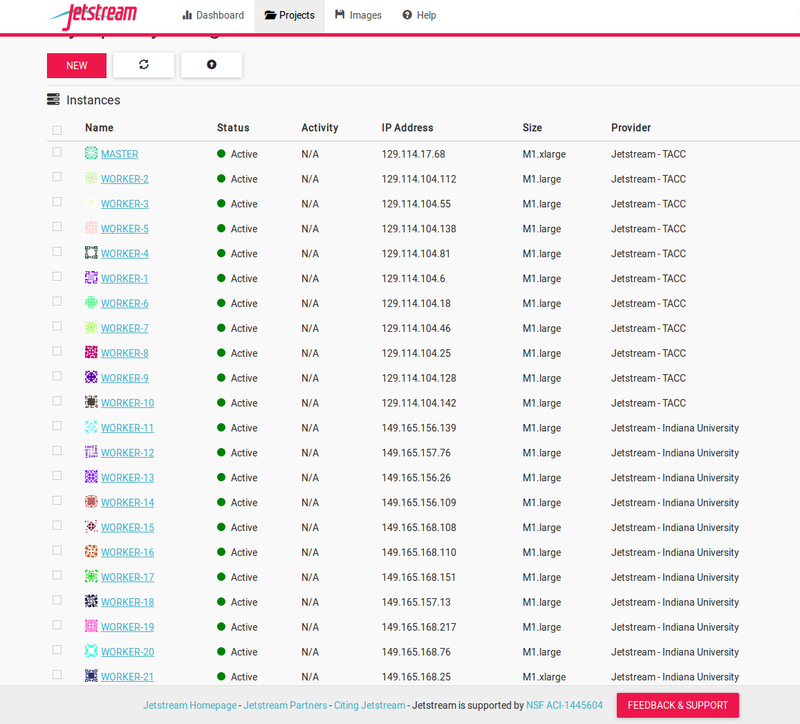 See that link for run setup and configuration. Before proceeding further, it should be noted that I neglected to provide Maker with a transposable elements FastA file for RepeatMasker to use. Probably the easiest and most logical approach from here is to start working with scaffolds that are annotated with a “protein_match”, as these have a corresponding GenBank ID. Parsing these out and then doing a join with a database of NCBI protein IDs will give us a basic annotation of “functional” portions of the genome. Additionally, we should probably do some sort of comparison of this run with the follow up run where I provided the transposable elements FastA file to see what impacts the exclusion/inclusion of that info had on annotation. Whoa! 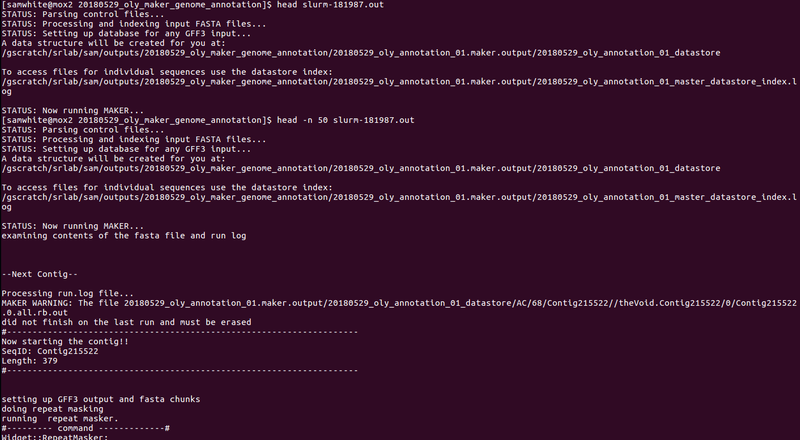 Genome annotation using Jetstream/WQ-MAKER that I started this morning is complete!! Only 7hrs! More detailed entry coming once I move files off of Jetstream and have a chance to look at things. Yesterday, our Xsede Startup Application (Google Doc) got approval for 100,000 Service Units (SUs) and 1TB of disk space on Xsede/Atmosphere/Jetstream (or, whatever it’s actually called!). The approval happened within an hour of submitting the application! Your recently submitted an XSEDE Startup request has been reviewed and approved. 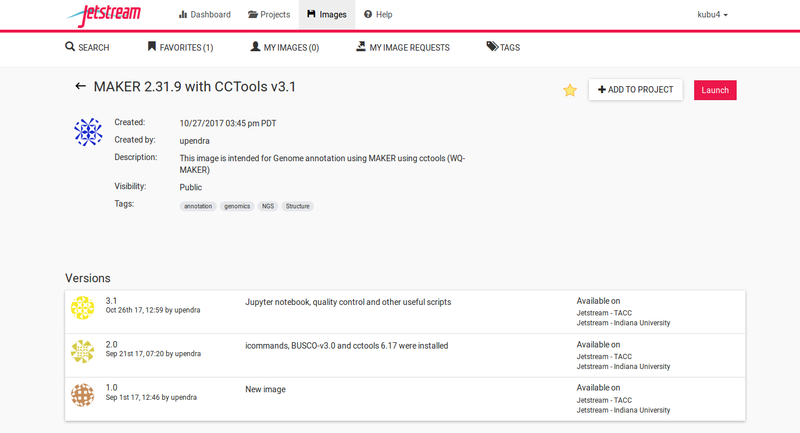 Request: Annotation of Olympia oyster (Ostrea lurida) and Pacific geoduck (Panopea generosa) genomes using WQ_MAKER on Jetstream cloud. The estimated value of these awarded resources is $14,890.00. The allocation of these resources represents a considerable investment by the NSF in advanced computing infrastructure for U.S. The dollar value of your allocation is estimated from the NSF awards supporting the allocated resources. If XSEDE Extended Collaborative Support (ECSS) assistance was recommended by the review panel, you will be contacted by the ECSS team within the next two weeks to begin discussing this collaboration. For details about the decision and reviewer comments, please see below or go to the XSEDE User Portal (https://portal.xsede.org), login, click on the ALLOCATIONS tab, then click on Submit/Review Request. Once there you will see your recently awarded research request listed on the right under the section ‘Approved’. Please select the view action to see reviewer comments along with the notes from the review meeting and any additional comments from the Allocations administrator. By default the PI and all co-PIs will be added to the resources awarded. If this is an award on a renewal request, current users will have their account end dates modified to reflect the new end date of this award. PIs, co-PIs, or Allocation Managers can add users to or remove users from resources on this project by logging into the portal (https://portal.xsede.org) and using the ‘Add/Remove User’ form. For all publications, please acknowledge use of XSEDE and allocated resources by citing the XSEDE paper (https://www.xsede.org/how-to-acknowledge-xsede) and also add your publications to your user profile. Tell us about your achievements (http://www.xsede.org/group/xup/science-achievements). Help us improve our reporting by keeping your XSEDE user profile up to date and completing the demographic fields (https://portal.xsede.org/group/xup/profile). For question regarding this decision, please contact help@xsede.org. Maker is a well-known and fitting workflow for Jetstream. This should be a good use of resources. After each user on the allocation has logged in, the PI will need to open a ticket via help@xsede.org and request the quota be set per the allocation to 1TB. Please provide the XSEDE portal ID of each user. 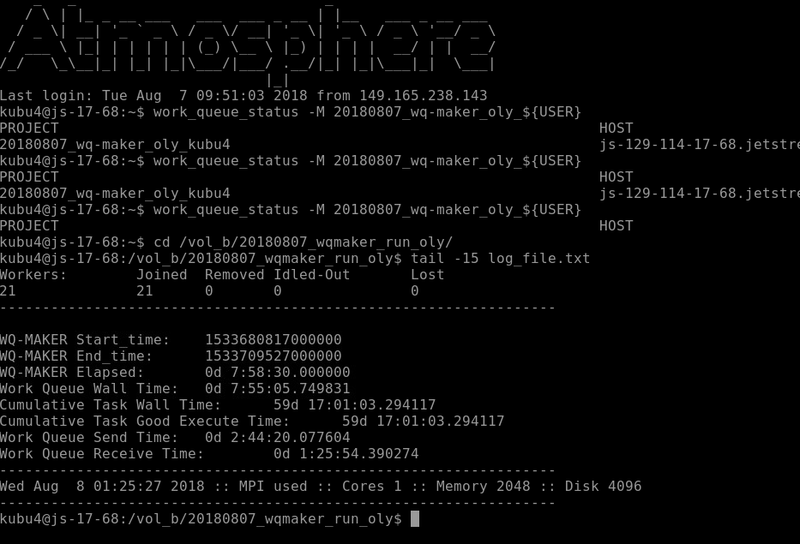 We had a tremendous amount of help from Upendra Devisetty at CyVerse in getting the Xsede Startup Application written, as well as running WQ-MAKER on Xsede/Atmosphere/Jetstream (or, whatever it’s called!). The “MASTER” machine was a “m1.xlarge” machine (i.e. CPU: 24, Mem: 60 GB, Disk: 60 GB). I attached a 1TB volume to the MASTER machine. I set up the run using 21 “WORKER” machines. Twenty WORKERS were “m1.large” machines (i.e. CPU: 10, Mem: 30 GB, Disk: 60 GB). The remaining WORKER was set at “m1.xlarge” (i.e. CPU: 24, Mem: 60 GB, Disk: 60 GB) to use up the rest of our allocated memory. I checked on the status of the run and you can see that there are 22 WORKERS and 15,568 files “WAITING”. BUT, there are 159,429 contigs in our genome FastA! This is because WQ-MAKER splits the genome FastA into smaller FastA files containg only 10 sequences each. This is why we see 10-fold fewer files being processed than sequences in our genome file. The two FastA files below were concatenated into a single FastA file (gigas_virginica_ncbi_proteomes.fasta) for use in WQ-MAKER. This is a bit difficult to read in this notebook; copy and paste in text editor for easier viewing. NOTE: Paths to files (e.g. genome FastA) have to be relative paths; cannot be absolute paths! All WORKERS were running as of 07:45 today. As of this posting (~3hrs later), WQ-MAKER had already processed ~45% of the files! Annotation will be finished by the end of today!!! Crazy! Per this GitHub Issue, Steven has cleared out files. Additionally, it appears that my job has just continued from where it was stuck. Very nice! I ran Quast to compare all of our current Olympia oyster genome assemblies. See Jupyter Notebook in Results section for Quast execution. After all the difficulties with PB Jelly, it has produced the most large contigs. However, it does also have the highest quantity and rate of N’s of all the assemblies produced to date. Interesting tidbit: The pbjelly_sjw_01 assembly is EXACTLY the same as the soap_bgi_01. Looking at the output messages from that PB Jelly assembly, one can see why. The messages indicate that no gaps were filled on the BGI scaffold reference! That means the PB Jelly output is just the BGI scaffold reference assembly!